This charging station features two AC outlets three USB ports and a cradle for setting your tablets or mobiles. 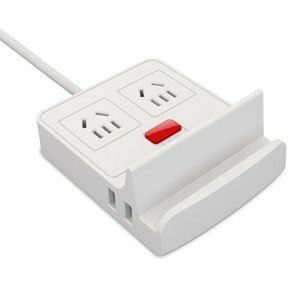 It allows you to charge your your digital devices in a convenient way like laptop cell phone camera tablet and MP3 player all from a single power outlet. Our USB charging station is a perfect solution for you to charge 3 of your many electronic products such as mobiles Ipad Camera etc. in the same time. And don't worry about the socket. It could support current as 5V 3A could charge 1 iPad and 2 mobiles together. This USB station is a perfect combination of USB hub and USB charging which is an ideal choice for office family travel hotel education etc. It is with portable size and has the following 5 functions. USB charging stations are required to facilitate the charging of multiple devices at one go or through one USB connection. You can get USB charging stations at SF Cable and order them from the ease of your homes. We have USB charging stations with 3 ports, USB hub & charging station, and USB charging station combo with 3 ports USB + 2 sockets + 1 slot. All our products are RoHS compliant and environment friendly. Customer satisfaction and safety is our ultimate goal. We provide quality services after sales and also offer lifetime technical support on our products.